"A week at the lake - relaxation, peace & quiet. But under the surface lies emotional unbalance." 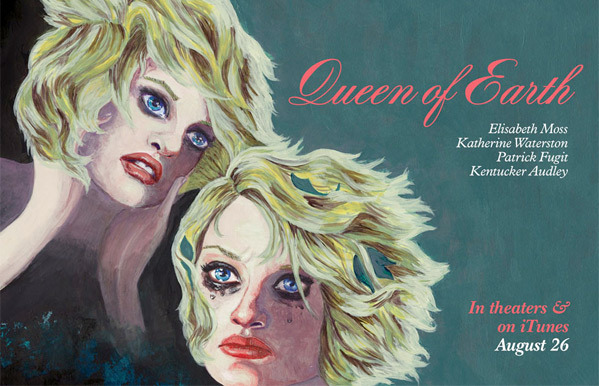 IFC has debuted the trailer for Alex Ross Perry's latest film Queen of Earth, which premiered at the Berlin Film Festival. Starring Elisabeth Moss, this eerie throwback to old school horror tells of a woman scorned after a break up who retreats to madness at her friend's lakeside cabin. Also starring Katherine Waterston, Patrick Fugit and Kentucker Audley. We just ran another international trailer a few weeks ago, but this is the official US version promoting the release next month. Elisabeth Moss is always worth complimenting, as she's so very talented, but this may not be everyone's cup 'o tea. I do like the way the critics' quotes scroll. Catherine and Virginia are best friends. Last year, Virginia wasn't doing well, while it's Catherine who's struggling this year. Virginia's parents own a lakeside cabin, the perfect place for a week of mutual wound licking. Sun pours in through the windows, framing the cool green of the trees outside. But this isn't the refuge it seems and it's not just the music that awakens the menace in the images. The ripples across the lake and the wan sunlight offer little comfort, to say nothing of the picture of a skull lying forgotten in a cupboard. Queen of Earth is written and directed by filmmaker Alex Ross Perry, of Listen Up Philip, The Color Wheel and Impolex previously. The film first premiered at the Berlin Film Festival and also played at BAMcinemaFest. Queen of Earth arrives in select theaters starting August 26th next month. A fascinating choice of editing for this trailer. Clearly, not for every one, but I found it positively novel. What was up with the voiceover? With a voiceover so strange. It must have been on purpose. The voiceover is supposed to sound like an old horror trailer. It's meant to sound silly. It's a throwback. Yeah dude, wish I could be 20 again, in my mid-late 40s.. probably still a bit young for the 70s trailer but I was exposed enough to them to see it in this funny, albeit crappy, trailer. Funny enough U mention CHL, I had my fiance watch it a week ago for her very first time.. Man I miss that man, truly one of the greatest actors ever.. not to mention a great man Lastly I'll leave you with "What we've got here is a failure to communicate"
It's supposed to sound like that. It's a nod to horror trailers from the 70's. Awesome retro style trailer. I like this "new" breed of horror film that gives a nod (and a wink) to 70's horror. FIlms like this one, It Follows and We Are Still Here to name a few. I caught a trailer this weekend that had an old lady who asked a teenage girl to clean out the inside of an oven and she locked her inside..I thought this was that trailer, can anyone help me and tell me the film I'm talking about? That's M. Night Shyamalan's new film, The Visit. Just so we are all clear no one like the 70's style movie trailer voice over guy? Also this movie looks terrible from this trailer.